Thomas now views his magic as less than good, but he must raise one more army. This one not of his creation though. For the first time he learns fear of the undead. More than ever, he longs to see the waters of the great sea to the west. Will he find peace there? Will Christina and he find a home with the people of the shores? Maybe. But, maybe he’ll have to fight magic darker than his own to keep his new home. Maybe he’ll have to fight magic so dark that even a half demon witch fears it and must help. 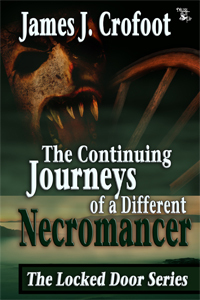 The Continuing Journeys of a Different Necromancer is the second book in a series, but it can be easily read as a stand-alone. Main character Thomas is a necromancer (you know, an evil wizard-like person who can raise the dead). Thomas isn’t evil though, and he’s actually struggling to find peace, and a place to call home. I liked his personality, and his own inner struggle, along with his struggle with the dark magic threatening him, was entertaining to read about. “Welll then, Thomas,” Conrad went on. This happens very often. Never ‘he’, or just leaving it out completely. Nope, always the name. It gets a tad annoying after a while. Then there are also instances of showing instead of telling. Overall, it doesn’t hurt the quality of the story, and it’s something that should be blamed on the editors more than the author, but it makes reading the book a less pleasant experience than it could’ve been. So overall definitely enjoyable, but the editing could’ve been more thorough.